Alexandria, VA — Over the memorial day weekend, a 20-year-old lifeguard had an apparent mental breakdown while on the job at the Riverside Apartments in Alexandria. When police arrive to help the man, they stood around and laughed as he drowned. The incident was captured on cellphone footage. 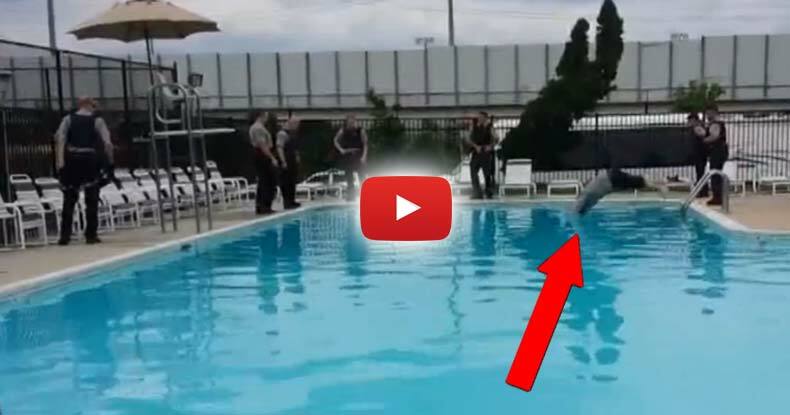 When police showed up, the lifeguard walked into the pool and never came up. The 20-year-old sank to the bottom and was underwater for nearly three minutes as cops are seen on video joking. After another lifeguard had enough of the cops not doing anything, he jumped in and saved the man’s life. Police, not wanting to be shown up, then jumped in — after the lifeguard had already pulled him up. According to 2nd Lt. Brian Gaydos of the Fairfax county police department, who attempted to paint the cops as heroes, police then jumped in, pulled the man up and gave him CPR — saving his life. After people became critical of the officers refusing to act, Gaydos stood up for his officers claiming that they didn’t know he was trying to drown himself, in spite of being underwater for nearly three minutes. “At that point, it is not believed that the gentleman was making any verbal threats to himself, about harming himself. And it seems to be just a fluid situation where they were talking to the gentleman, he was entering the pool, exiting the pool. And just trying to calm the situation down and get him the crisis intervention that he needed,” said Gaydos. When asked about the criticism, according to WUSA 9, Lt. Gaydos said if the man who jumped in was a lifeguard, that it was appropriate that he pulled the young man out, because police officers are not trained to do water rescues. Every Fairfax County Police Officer is trained in CPR, he added. “The officers would’ve put his life at risk if he would’ve jumped right in with all of his gear on. And then we would’ve had to rescue two people as opposed to one,” said Gaydos. Fortunately, the lifeguard wasn’t afraid and actually jumped in. Had the young man stayed under water any longer, he would have likely been unable to revive. He is now in stable condition at a local hospital. This is the second such instance in which police officers were recorded standing around while someone drowned. In April, Dashcam footage captured several deputies standing around laughing as three teenage girls drowned in front of them. In that instance as well, the department hailed the cops as heroes.